Developed by Let’s Get Together! and designed for youth, balloon twisting is the newest activity that helps participants learn how to focus, challenge themselves and be more patient while expanding their creativity in a fun and inclusive atmosphere. Youth will also learn how growth mindset – combined with a few natural self-calming, stress-reducing techniques – can be used to make learning new skills easier. Participants who learn this unique skill will have another cool activity in their “life toolkit” that encourages them to put down the electronics, explore creative arts and enjoy building meaningful connections within the community. Ideal for ages 6+ and families. Send us a request for a workshop and we will follow up with available dates, workshop details and requirements. The goal of this initiative is to teach youth a fun, creative and employable skill while promoting the importance of growth mindset, healthy social skills and acceptance of self and others. 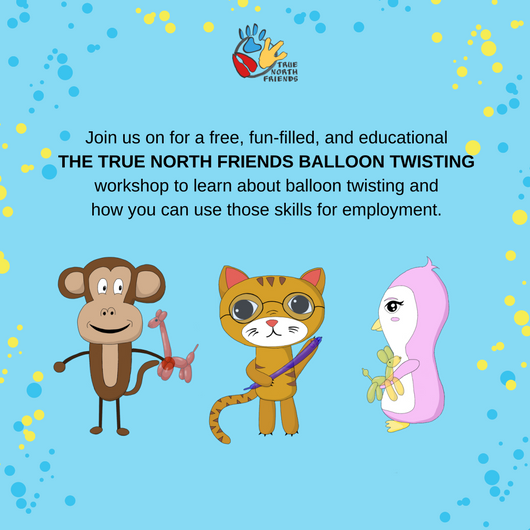 After this workshop, your newly trained “Junior Balloon Twisters” can then help launch new Junior Balloon Twisting Clubs with a club starter kit (available at extra cost). Youth who learn this creative skill will have another cool activity in their “life toolkit” that encourages them to put down the electronics and enjoy building meaningful connections within the community. The ideal space is a classroom, library or a venue with desk, chairs and minimal distractions. We provide all the balloon twisting supplies along including a take-home kit (including pump & balloons) for participanting youth. Club starter kits are available for purchase. We have a short video and powerpoint presentation to share so we kindly ask your organization to provide a screen, projector, laptop and sound equipment. If you’re unable to provide any of these materials, please let us know in advance so we can make adjustments to our presentation. Since one of the primary goals is to help your school start your own Junior Balloon Twisting Club, it’s best to try and recruit at least youth who are willing to help start the club after they’re trained. Youth who have a positive attitude towards learning, enjoy trying new things, work well on a team, has past experience helping others, is a good communicator, and is willing to invest time into growing this initiative would be ideal. Once we confirm your workshop date and room location, at your request, we can send you a customized flyer and a parent letter to send home. For social media, we kindly ask that you tag the following partners @GetTogetherTO @TruNorthFriends (Twitter) @TrueNorthFriends (Instagram) and use a hashtag #TrueNorthFriends. We will also send you a copy of our photography and media release form to review with the parents and school administration.